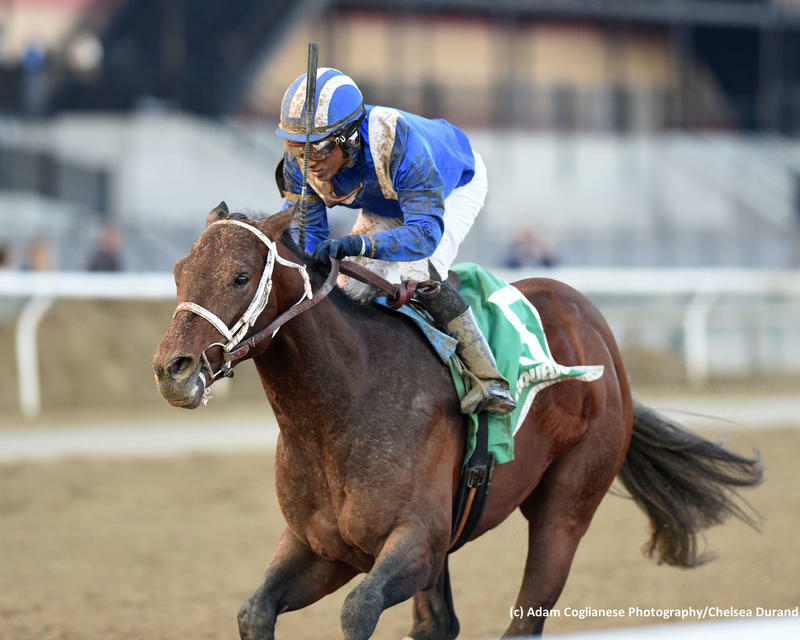 Haikal rallied to win Saturday’s $300,000 Gotham (G3) at Aqueduct, erasing a sizable deficit in the stretch to post a one-length decision, and earned 50 points in the Kentucky Derby qualifier. Kiaran McLaughlin trains the Shadwell Stables homebred and Rajiv Maragh was up. Instagrand, the even-money favorite among eight contestants, offered a bid before coming up a little empty, finishing third in his first start since mid-August. Contested at a one-turn mile, the Gotham awarded a total of 85 points to the top four finishers (50-20-10-5 scale) as part of the Road to the Kentucky Derby series. Haikal has now won three straight, competing exclusively at Aqueduct in a four-race career, and the confirmed late runner increased his earnings to $298,900. He broke his maiden the second time out in mid-December and was exiting a neck victory in the seven-furlong Jimmy Winkfield on February 9. By Daaher, Haikal left the starting gate as the 4-1 second choice and rated toward the back of the field as Much Better established taxing fractions in :22.36 and :44.42, reaching the midway point up by 3 1/2 lengths. Instagrand stalked behind the pacesetter and reduced the margin on the far turn, looming a serious threat to the outside turning for home. Mind Control advanced to make it a three-horse contest entering the stretch. Haikal still had plenty to do in midstretch but launched an eye-closing bid in the latter stages, closing dramatically to overhaul his opponents and edge clear under the wire. He stopped the teletimer in 1:35.63. Mind Control wound up second at 5-1 odds, a half-length better than Instagrand. It was another nose back to Much Better. Out of an unraced mare by Distorted Humor, the Kentucky-bred Haikal counts Grade 1-winning sprinter Takaful as a half-brother. He could make his first two-turn start in the 1 1/8-mile Wood Memorial (G2) at Aqueduct on April 6. “He showed me every indicator that he'll excel the further the distance goes, so that's not anything that I'm concerned about,” Maragh said. “I'm actually looking forward to him running those long distances."